This is a great summer recipe! Your bird’s favorite fruit(s)! We recommend blueberries, raspberries, mango, papaya, pomegranate, or banana! 1) Puree fruit in blender. You can add water to achieve your desired consistency. 2) Pour into ice cube trays. *Vegetables can be used as well- summer squash or sugar snap peas work well! *Pellets, seeds, or chunks of dried fruit/vegetables can be mixed in for a fun surprise! 3) Create a loop from the leather strip by making a knot with both ends. String half of the loop through the hole. 4) Mix together pellets, seed mix and dried fruit. 9) Remove cooked bell from pot. Pot should slip off easily. Quinoa (pronounced “keen-nwa”) is a South American grain that is high in protein, calcium, and phosphorous. It is available in most health food stores as a bulk grain. Boil 2 cups of water, add quinoa. Cook for 10 minutes, then add fruits and cinnamon. Cook another 5 minutes or until the quinoa grain is clear and has a tiny tail sprouting from it. Add more water as needed. Let cool and serve. 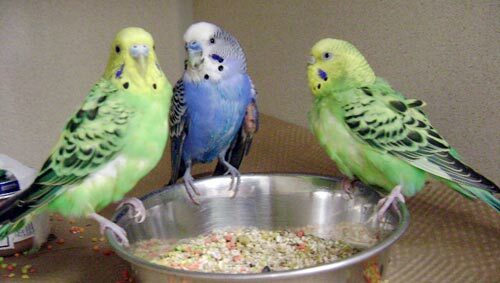 You can use almost any veggies or fruits that your bird enjoys to this recipe. Use popcorn cakes, a corn version of rice cakes, available in all health food stores and most supermarkets. Spread a thin layer of peanut butter on top of the popcorn cake. Top with your birds’ favorite healthy foods such as: grated carrots, chopped broccoli, fresh berries, fresh peas, or even a small amount of grated mozzarella cheese! 1) Combine seed mix and egg-food/egg-biscuit. Combine flour, baking soda, cinnamon. In another bowl, beat eggs, add carrots, oil, pineapple, and nuts. Stir moist ingredients into dry ingredients, mixing just until moistened. Spoon into 2 greased & floured loaf pans. Bake at 350 degrees for 65-75 minutes or until loaves test done. Cut yams into quarters then boil until soft. Drop in raisins for the last 5 minutes of boiling. Put peeled yams back in pot and mash, adding butter and pumpkin spice. Add back raisins and corn and mix into the yams. Garnish with a dollop of nonfat yogurt on top of each serving. These recipes are meant to be used as treats only, not as the primary diet of your pet. Do not substitute avocado, chocolate, or products with caffeine or alcohol for any of the ingredients we recommend. Consult your veterinarian if you have any questions.